As the Fabulous Thunderbirds croon, “Wrap it up. I’ll take it.” And one of the best items for “wrapping it up” in the kitchen, is cooking twine. 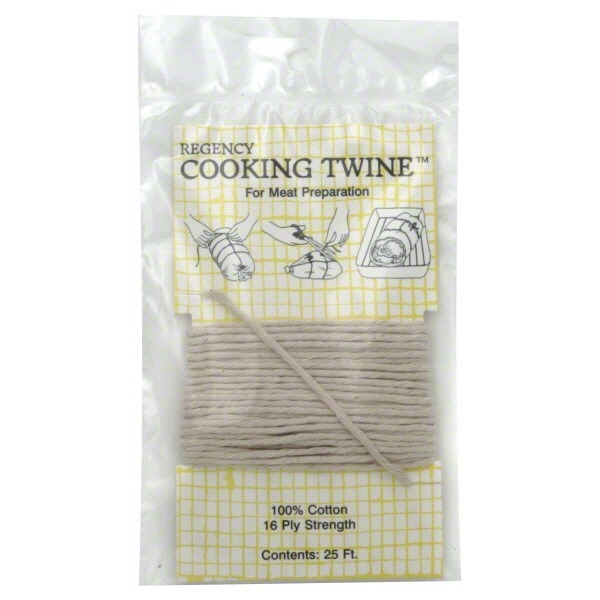 As with searing roasts, cooking twine is essential for sealing in the flavors of your food. When certain menu items are wrapped up tight with cooking twine, all of the delicious flavor stays right where it should be…in your food and ultimately on your fork! Cooking twine, otherwise known as kitchen twine, can be also used to do what they call “trussing the bird.” Basically, trussing the bird is tying the legs together and the wings in tight so that it doesn’t splay while it cooks – resulting in a beautiful presentation. Using cooking twine to tie the legs and wings of your chicken or turkey also prevents the tips from scorching. You can also use cooking twine to tie cuts of meat, such as lamb leg and shoulder, as well as tenderloin roasts in to more compact shapes for more even cooking. Finally, one of the most frequent uses for kitchen twine is to hold the stuffing in your chicken breasts, pork chops and loins. Aside from keeping that tasty filling from seeping out, it will keep your flavors locked in in this instance as well. Go to HousewareWarehouse.net for cooking twine and so much more! Houseware Warehouse is America’s leading supplier of high quality, online, wholesale, kitchen supplies.